If you were part of our community last Yom Kippur, you witnessed something truly amazing: an entire congregation filled with the spirit of God. On Yom Kippur morning I asked everyone to count our blessings, and to take the gratitude we feel and turn it into food for the hungry. 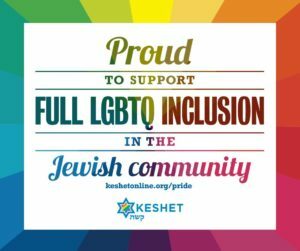 I asked you to go out – on Yom Kippur Day! – and buy food for our food drive, even if you had already brought some. I asked you to buy lots of food; what I actually said was, “go buy too much food,” and bring it back before the day ends. I admit it was an unorthodox request. Quite literally in this case, as our Orthodox brothers and sisters would blanch at the thought of shopping on Yom Kippur. But I asked you not to shop for yourselves – not even to “graze” a little as you went down the aisles – but to concentrate on buying food for those who have nothing to eat. – You went to all the local supermarkets – Wegman’s, ShopRite, A&P – dressed in your holiday clothes. – In the stores you saw other dressed-up people clutching a white piece of paper in their hands – copies of the shopping list we gave you as you left the high school that morning. – You blew the minds of the cashiers, who had no idea why so many beautifully dressed people were shopping for such immense quantities of food. – You came back to the school with your cars filled – literally filled, from front to back and floor to roof. – And most surprising of all, most wonderful of all, was that every single one of you was smiling as you unloaded your cars! If you were there, you know what I am describing. If you weren’t, try to picture it. Try to picture a thousand people leaving Marlboro High School and making a beeline for their favorite supermarket, buying too much food and running back to the school to load it into the truck. It reminded me of the story of our ancestor Rebekkah, who ran to the well to bring water to a caravan of camels; Biblical commentators remarked on how excited she was to be able to help, and that is what I saw on Yom Kippur. You were excited to help! Now the question is, can we do it again? Can we re-create that feeling, that joy, that spirit of God that filled us with the desire to do everything we can to help people we don’t know? This year you will have many choices about how to spend your Yom Kippur Day. But whether you come to the early or late morning service, the Children’s Service, our new, experimental “Sinful Texting” afternoon program, the Healing Service, Yiskor or Ne’ilah, there will still be time for you to shop for the hungry if you want to make this your new Yom Kippur tradition. If you prefer, you can shop before Yom Kippur; you’ll receive the shopping list on Rosh Hashanah, as always. Whenever you choose to shop, the question is whether you can do it with the same sense of challenge, of excitement, of holy response to God that we all found last year. On Rosh Hashanah I will talk about passion and joy in Jewish life. But if you were one of the thousand people who jammed food into their cars and gave it away last Yom Kippur, you already know what I mean. If you weren’t there, here’s your opportunity to learn, to share, to be touched by God. Shira joins me in wishing you a happy, healthy and joyous New Year!